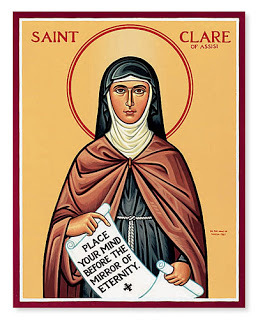 Today is the Feast Day of Saint Clare, the founder of the Second Order of Franciscans. Most people are familiar with her history, so briefly: Chiara Offreduccio ran away from home to join Francis when she was 18. Francis promptly stuck her in Benedictine Monastery, but as soon as possible, she was transferred to San Damiano where she founded the Poor Ladies (or Clares, as they are now called) and lived for the next 40 years. She was later joined by both her sister, Agnes, and her mother. Saint Francis was 12 years older than Clare, and until his death in 1226 served as her spiritual guide and mentor. They maintained a very special relationship although they almost never saw each other. Nevertheless, their love for each other carried them each through some particularly hard times, and it is difficult now not to think of one when you think of the other. Clare died in 1253. He Christ is the splendor of eternal glory, the brightness of eternal light, and the mirror without cloud. Gaze upon Him, consider Him, contemplate Him, as you desire to imitate Him. I come, O Lord, unto Thy sanctuary to see the life and food of my soul. As I hope in Thee, O Lord, inspire me with that confidence which brings me to Thy holy mountain. Permit me, Divine Jesus, to come closer to Thee, that my whole soul may do homage to the greatness of Thy majesty; that my heart, with its tenderest affections, may acknowledge Thine infinite love; that my memory may dwell on the admirable mysteries here renewed every day, and that the sacrifice of my whole being may accompany Thine. Totally love Him, Who gave Himself totally for your love.